Home / About Me / At Home / Too Cute Alert! Tia went to the groomer today, so she’d be beautiful for Christmas! I thought I share some pictures we snapped right after I brought her home. I’m not sure why the pictures turned out a little blurry. 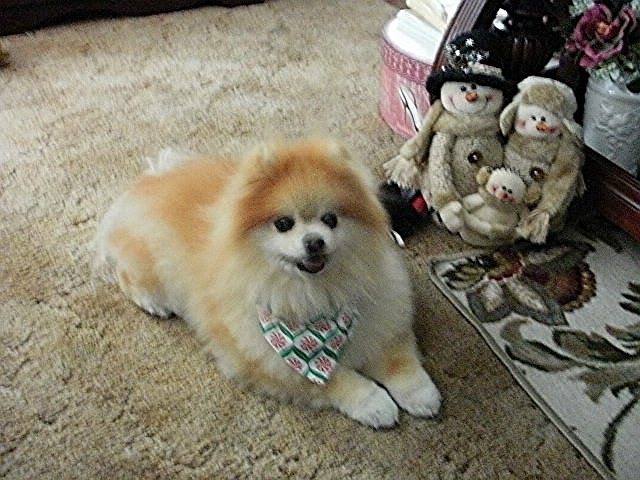 Tia, our Pomeranian, after visiting the groomer. I took Tia, our Pomeranian, to the groomer today. She doesn’t like to go. It’s so hard to leave her there because she hates it. The groomer says she’s fine once I leave, and she never acts like she’s been harmed in any way when I return, but you would think that I was abandoning her when I drop her off. Jasper, our cat, is not impressed with the way Tia smells. Jasper, our cat, came over to check her out when I first brought her home. Jim and I thought Tia smelled really good, but one look at Jasper’s face and you can tell he’s not impressed. 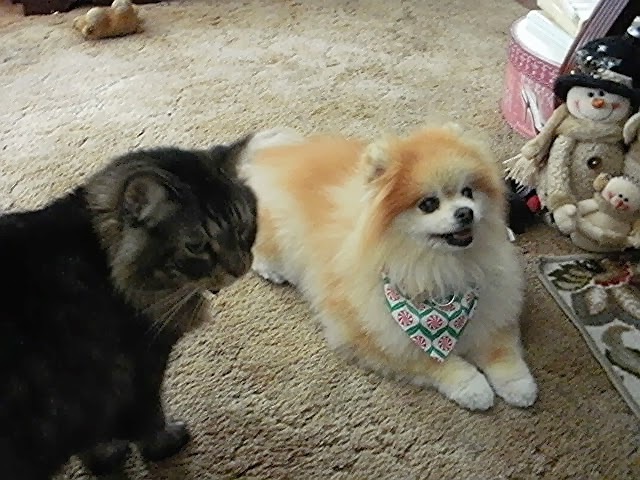 See how happy Tia looks with the candy cane bandanna the groomer gave her! Obviously, she likes the way she looks in it. She’s a happy little dog. Doesn’t she look cute? Now we just have to keep her clean until Christmas, so she’ll look pretty in her red Christmas coat with the black fur collar. Ten more days until Christmas! PrevPreviousDo you love art with Roosters?